When a writer chooses a name suggesting that two personas occupy one body (as in the nom de plume Mark Twain), the reader should take this self-definition seriously. Years ago, Dr. David James Fisher, psychoanalyst and intellectual historian, wrote a short paper on Twain’s difficulties with writing Huckleberry Finn. 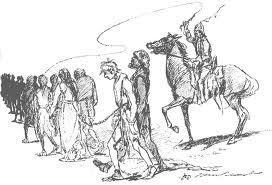 As I recall, in the scene where Huck, after determining that he feels as bad doing right (obeying the law) as doing wrong (risking a link to abolitionism), and hence will not turn the escaped slave Jim in to slave-catchers, Twain put down the manuscript and did not pick it up for several years. In any case, in the published version, the paddles of a looming steamboat capsize the raft and both Huck and Jim are in danger of drowning. The next Twain fiction was A Connecticut Yankee in King Arthur’s Court (1889), with pointed illustrations by Dan Beard, the latter said to be even more of a radical democrat than Twain. As for the plot, briefly, a 19th century weapons engineer, an ex-worker risen to foreman of the Colt factory, after a blow to his head, wakes up in 6th century Britain, where he introduces modern science, weapons, factories, modern communication including railroads, education, and newspapers in order to rescue the oppressed masses and to institute a Republic, modeled after the Northern U.S., perhaps New England. This blog reacts to my third reading of the novel, with some thoughts regarding ambivalence in the Missouri-born author, with special reference to the ways some 20th century critics have appropriated the novel, in my view, missing what is most interesting about it. Here comes a brief meditation on my response to the novel. 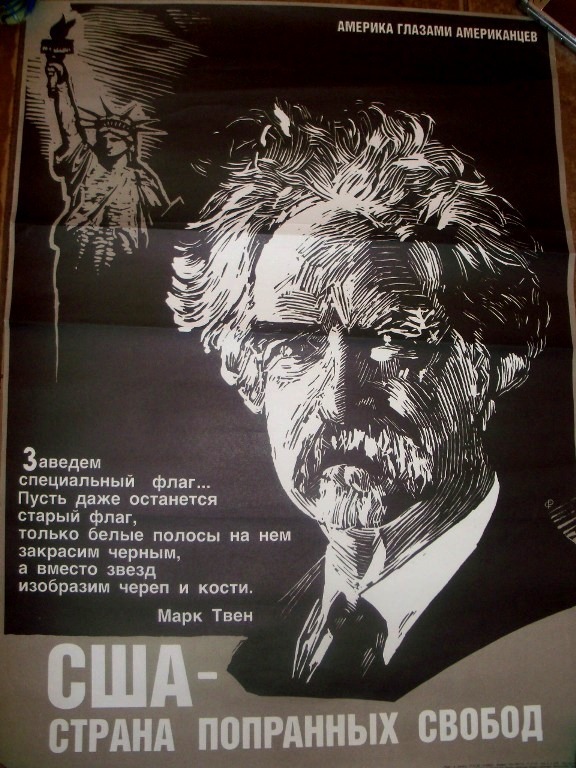 Mark Twain was heavily promoted in the Soviet Union, for more reasons than his objection to the Spanish-American War. Reading CYKAC, one can see why. The narrator of the tale, Hank Morgan states that, regarding the French Revolution, though he started out as a Girondin (a moderate bourgeois, like Condorcet), he ended up as a sans-culotte! Moreover, both Twain and his fictional persona believe that armed struggle is the only route to revolution. When you tote up the casualties of the Terror, they are as nothing compared to the crimes against humanity inflicted by the heartless aristocracy. Soviets elevated Robespierre and other Jacobins, while many conservatives and centrists alike have drawn a straight line between Jacobins and 20th century Fascists and Nazis. One can almost hear Gyorg Lukás applauding Twain’s/Morgan’s reference to false consciousness, a failing that could be rectified by re-education by a communist vanguard or the “cultural Marxism” of the Frankfurt School critical theorists. But, such a (culturalist) reading misses one of the most obvious themes of the novel: that modern technology, especially modern weaponry, has changed the nature of warfare; that such innovations as the Gatling gun (mentioned many times in the text, and occasionally deployed in the Civil War), plus the shocking and unprecedented casualties of that conflict, had led, combined with the passivity and herd-behavior of the masses, turned Twain against the very optimism with which “the [Nietschean?] Boss” had begun his innovations. By the end, the would-be republican Twain has killed off his protagonist; he is no radical, but a bohemian who been fantasizing freedom, but finally bows to the all-powerful masters. Hank Morgan’s modernizing efforts cannot stave off the all-powerful Church and its befuddled masses. He has assumed the tragic, nihilistic demeanor of the author of The Mysterious Stranger. No Soviet commissar would have approved such disillusion and cultural pessimism, although Henry Nash Smith, remarked that Morgan’s top-down modernization plan was Soviet in conception. Many a historian has studied the transition from feudalism to capitalism. Few, if any, would disagree with the notion that it is impossible to modernize without movement toward mass literacy and numeracy, competitive markets and the scientific world-view that markets encourage, except those Leninists, perhaps, who believe that the dread bourgeois phase of development can be leaped over straight into heaven on earth. To them, I recommend Twain’s famously ‘failed’ tragedy, with the proviso that the author, in Life on the Mississippi (1883) had hard things to say about soul-less machines and even mentioned Frankenstein. Henry Nash Smith erred in identifying Twain with Hank Morgan (ostensibly a laissez-faire capitalist), although there is something of Hank in Twain’s character. Smith, Henry Nash. Mark Twain’s Fable of Progress: Political and Economic Ideas in “A Connecticut Yankee” (Rutgers UP, 1964). While the quasi-socialistic William Dean Howells and Melville-admirer Edwin Stedman thought that the novel was Twain’s masterpiece, Smith makes the book an evasion of the true nature of class struggle in the laissez-faire Gilded Age; a product of “Promethean” Twain’s regrettable Anglo-phobic “jingoistic nationalism”; and finds philistine folk humor too weak a reed to carry the immense project of the novel. Twain was simply not up to the challenge, and problems with his own finances explain the unconvincing and depressing finish. He does not note a possible reference to Civil War casualties, nor does he associate the knightly class with Southern slaveholders, but he does see Twain as sympathetic to some noble aristocrats. He is also put off by Dan Beard’s naughtily [Jacobin] illustrations, that had no basis, Nash says, in the text. I disagree with that judgment. Beard’s affinity with Tom Paine was obviously shared by Twain throughout. http://www.twainquotes.com/19600306.html. Joseph Wood Krutch on how the Soviets got Twain wrong. http://en.wikipedia.org/wiki/Ronald_Takaki, author of Iron Cages: Race and Culture and 19th Century America (Knopf, 1987). Takaki associates Hank Morgan with Melville’s Captain Ahab. http://tinyurl.com/7y8usec. Richard Nielsen quoting Max Weber. Teaches at Boston College. The Soviet poster says: “We can set up a special flag, just the same flag with the white stripes black and the stars replaced by the skull and crossbones. 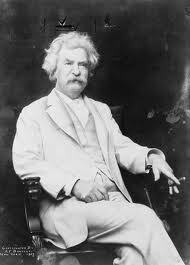 — Mark Twain” Then at the bottom: AMERICA – THE NATION OF TRAMPLED RIGHTS.